With Eric Koston’s first Nike SB signature sneaker and the crazy Kobe Bryant collabo are getting a ton of attention at the moment, you may have forgotten about the other Swoosh skateboarding shoe to which Koston was attached. 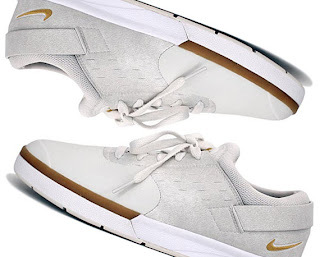 But just look back in the history books (or read through the Sneaker News archives) and you’ll find that Koston was the man of the hour when the “Technical without all the bells and whistles,” Nike SB Zoom FP hit retailers late last year. 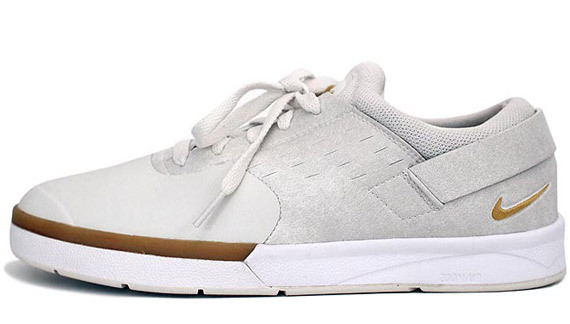 Most of the colorways since then have been dark but here’s a new Future Primitive that looks dope in a mix of white and gold with a stripe on the forefoot midsole to suggest gum rubber. Another great white summer sneaker alternative, you can find these at select Nike SB retailers like Goods.